A massive Toyota dealership with drive-through service lanes, more employees and a gourmet cafe has opened in Edmonton. Toyota Northwest Edmonton Toyota opened its doors Monday. For nearly 30 years, the dealership was known as Kingsway Toyota. It’s now a 97,500 square feet (9,000 square metres) in size and has 35 service bays, four detail bays and three drive-through service lanes. Dealer principal Patrick Priestner said in a statement he expects the number of employees to rise to 165 from 125. While waiting for the work to be done on their vehicles, customers can access a gourmet café stocked with hot and cold food items and specialty coffee. There’s also a gaming area where kids can have fun while waiting. 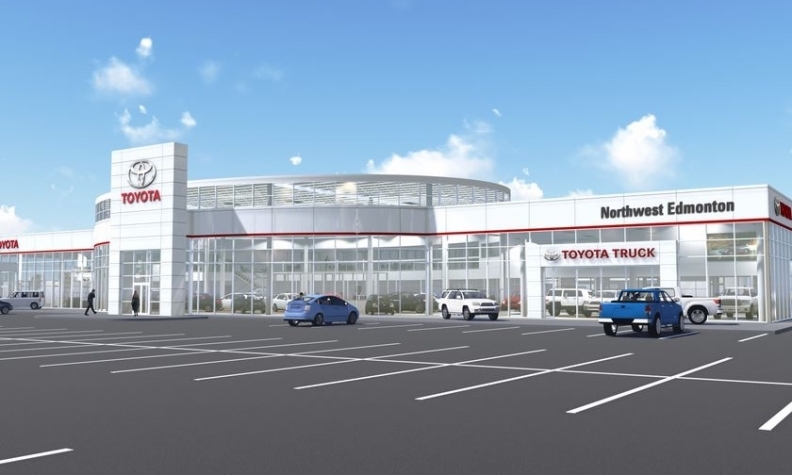 “Our goal with the new dealership was both simple and ambitious: to elevate the overall experience when purchasing a Toyota in Edmonton,” Priestner said in a statement. The dealership is also equipped with solar-reduction glazing in the showroom, which reduces energy consumption by reducing the need for air conditioning in the summer. LED lighting and sensors also reduce the amount of power that’s consumed. And the exhaust system in the vehicle area is variable speed, so it can match demand.